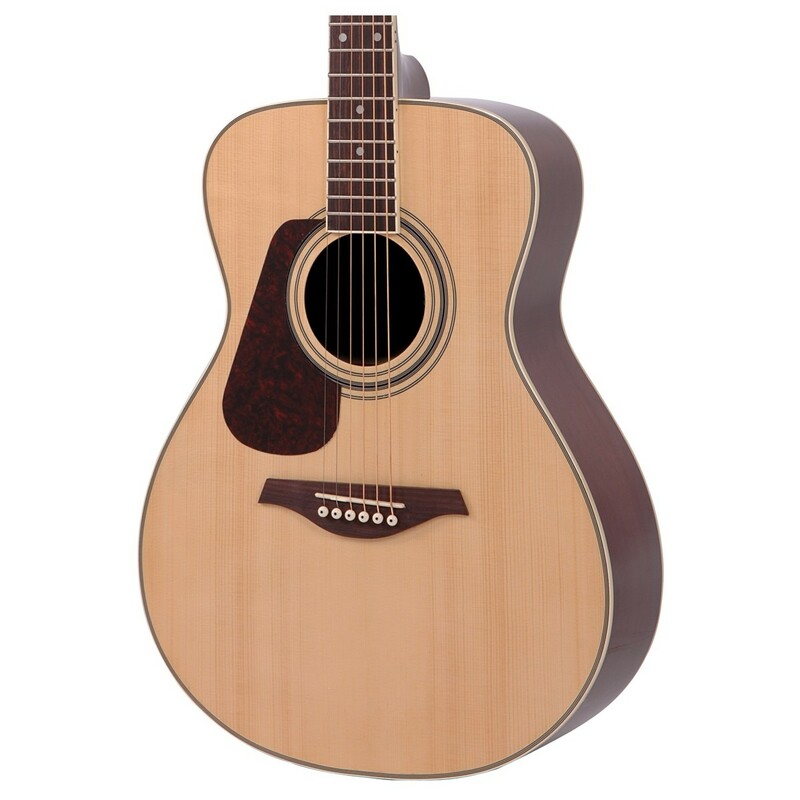 The Left Handed Vintage V300 Folk Acoustic Guitar, Natural provides the perfect blend of comfort, projection, and tonal bliss for beginners, small players, and travelling musicians. Its comfortable folk body is crafted from mahogany with a solid spruce top, delivering a versatile performance with excellent dynamics and focus. 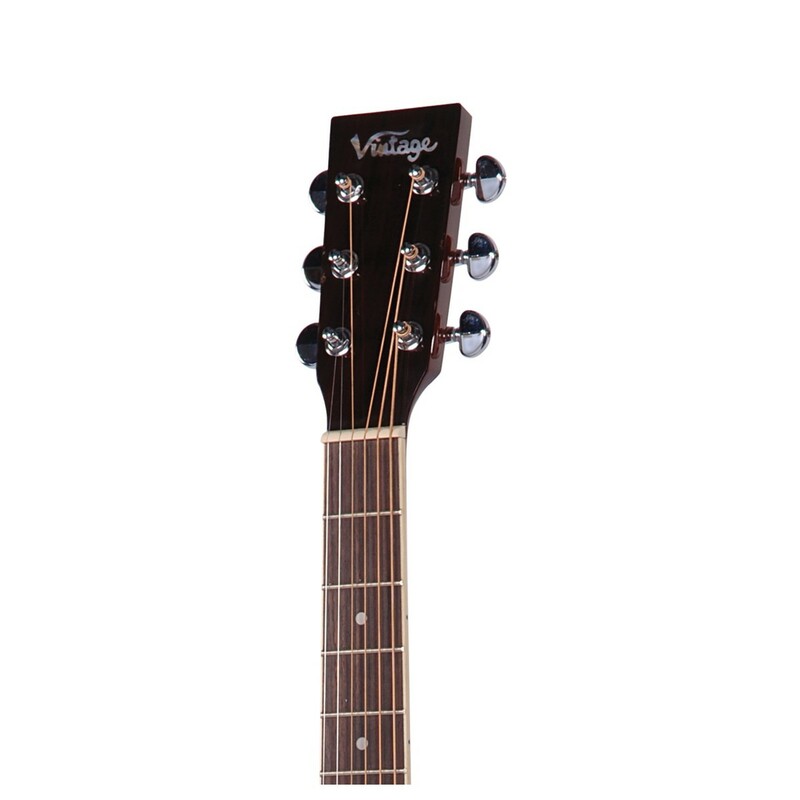 An eastern mahogany neck and rosewood fingerboard are also added to enhance the Vintage V300?s natural warmth and resonance. Its tortoiseshell pickguard, die-cast tuners, rosewood bridge, and natural finish complete its stunning looks. Awarded the ''Best Acoustic Guitar Under 1000 Pounds'' by Guitar Magazine in their end of year round up, the Vintage V300 Acoustic is perfect for both aspiring and travelling musicians. The Vintage V300 features a solid spruce top, delivering a versatile tonal character that responds superbly to numerous playing styles with ease. The spruce tonewood also yields a crisp and articulate sound with a broad dynamic range and a focused, clear sound, creating deep lows, warm mids, and bright singing highs. The solid top is accompanied by eastern mahogany back and sides, producing a resonant warmth with a distinct quality. Used as back and side panels, the mahogany delivers a meaty mid-range and a punchy, woody tone, with plenty of depth and complexity that will please most playing styles. Constructed from Eastern mahogany, the neck infuses the V300 folk guitar with beautiful warmth, resonance, and a clear top end. Using mahogany for both the body and neck enhances its natural resonance, allowing it to respond superbly to numerous techniques and playing styles with ease. The neck is topped with a rosewood fingerboard that adds warmth and clarity to the overall tone, while its smooth surface provide a comfortably energetic playing experience. 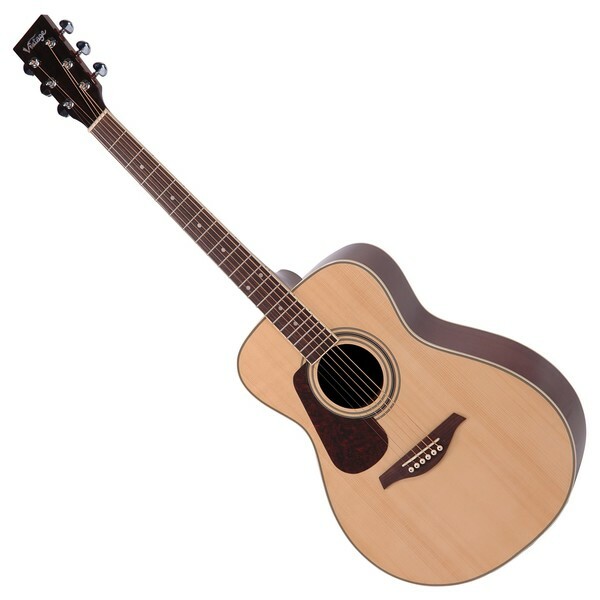 The Vintage Acoustic Guitar features a small and curvy folk body shape, offering an incredibly comfortable playing experience while still delivering plenty of projection. Its curvaceous design sits snugly in the player’s lap, providing a smooth performance suitable for beginners and smaller players. Its shape favours finger-style playing, offering a soft, bright tone with a great low-end response for added bass and volume.